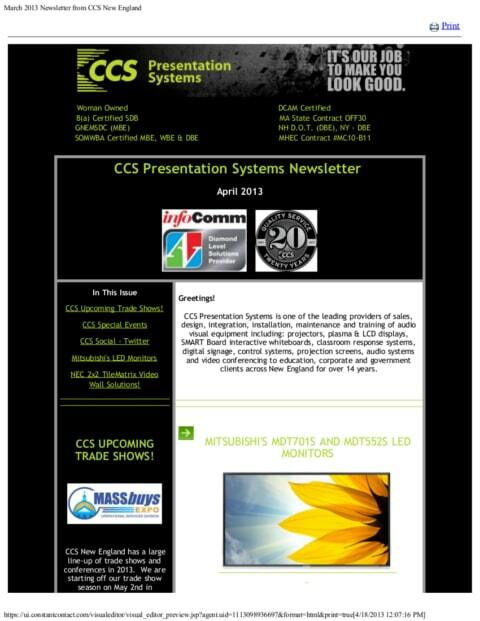 CCS Social—Follow and Like Us! 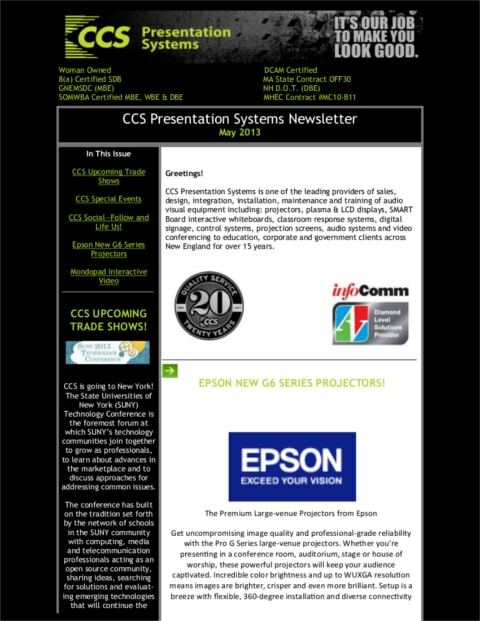 Get uncompromising image quality and professional‐grade reliability with the Pro G Series large‐venue projectors. Whether you’re presenting in a conference room, auditorium, stage or house of worship, these powerful projectors will keep your audience captivated. Incredible color brightness and up to WUXGA resolution means images are brighter, crisper and even more brilliant. NEC 2×2 TileMatrix Video Wall Solutions! Business professionals today want high tech, sleek-looking monitors that display brilliant moving or static images. Mitsubishi Electric Visual Solutions America, Inc. has an impressive response to this demand with the introduction of the 70-inch MDT701S monitor – one of the thinnest available today, and the 55-inch MDT552S – featuring a super-thin bezel with a super-slim body depth. The switch from typewriters to computers, telephones to cell phones, and film projectors to digital projectors were welcomed technological changes. In today’s world where many of us have smartphones, computers, iPads, etc., and the ability to connect any and all of these devices together in seconds—technological change can be challenging. As new platforms and devices roll out, our options expand exponentially, but there are limitations. Chris Gamst explains further in his article for AVNetwork.com. Click on the link above to see the full article! SMART Interactive Projector—LightRaise 60wi at CCS! 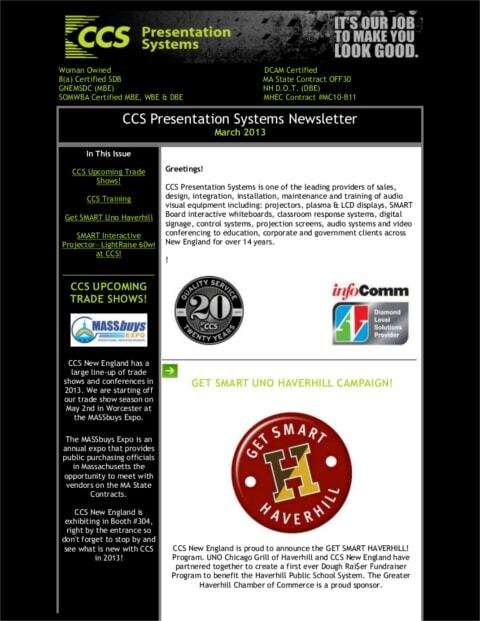 CCS New England is proud to announce the GET SMART HAVERHILL! Program. UNO Chicago Grill of Haverhill and CCS New England have partnered together to create a first ever Dough Rai$er Fundraiser Program to benefit the Haverhill Public School System. The Greater Haverhill Chamber of Commerce is a proud sponsor.